College students have moved their attention online. How is your business reaching new customers in this new era of advertising? Students have changed the way they consume information, meaning they've also changed the way they interact with local advertising. The end result is that it is increasingly difficult to reach this valuable demographic via traditional print or radio advertisements. 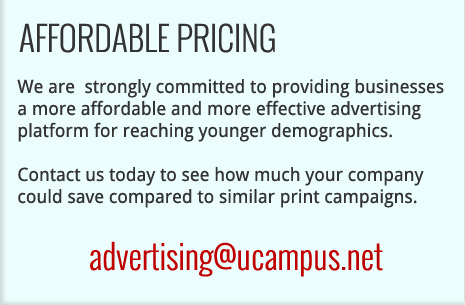 UCampus specalizes in helping advertisers reach college students in a new age of advertising. Our marketing platform creates the maximum exposure for your message at a small fraction of the cost of more traditional advertising campaigns. Our advertising process creates incredibly broad and diverse exposure for your brand while laying the foundation for consistent returns through our platform. Our in-house design team begins the process by creating a "premium profile" for your business or brand. These profiles visually showcase your message and have a proven track record of generating new customers. Your campaign is promoted via our unique marketing platform. Your message is broadcast via UCampus Twitter accounts, Facebook accounts, Pinterest accounts, and our daily email newsletter. Our website users organically discover your message witthin our directory while they use and navigate their UCampus website. Users are directed to your profile and are encouraged to take action and/or share socially. Your business and your information is automatically promoted through several platforms each month. We generate consistent exposure and results for your business even after your official campaign ends. The UCampus network has the potential to reach students across the entire country. Design a campaign best suited to your specific needs. UCampus provides a unique location management platform that helps larger companies control their online information, visual branding, and marketing message. 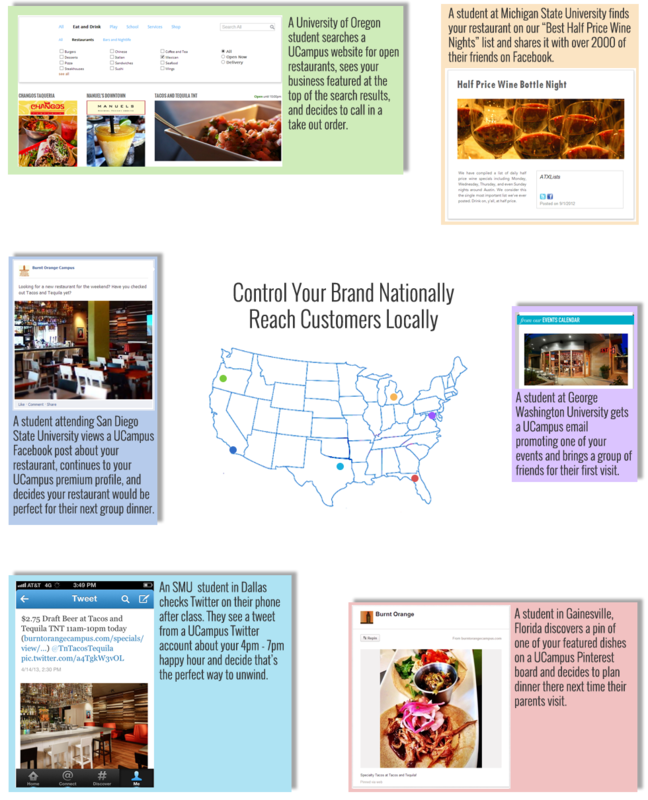 How local customers find and connect with your company is quickly changing. Students have changed how they discover and share new businesses. 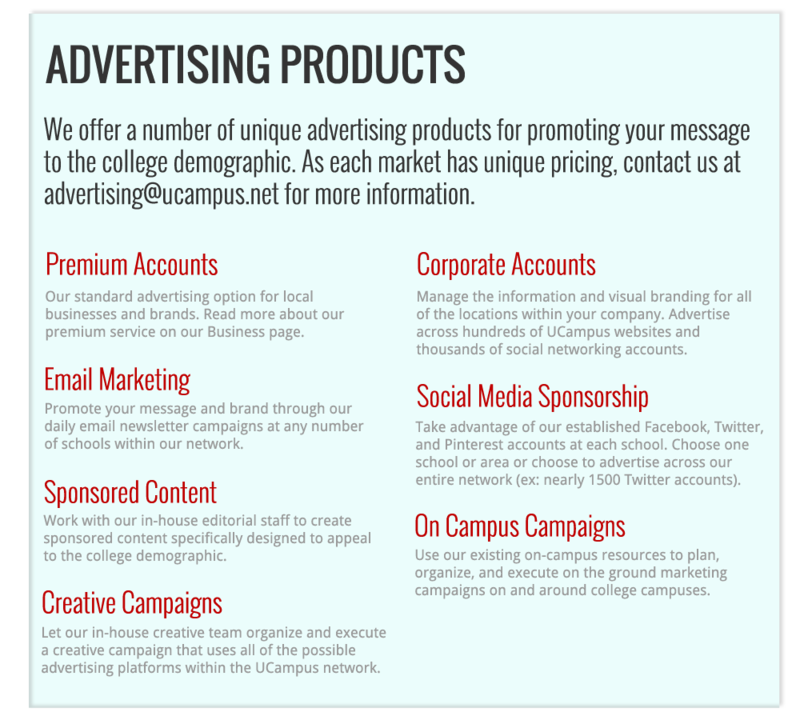 The UCampus platform helps large companies control their brand and messaging at a national level while providing valuable local advertising directing new customers to specific physical locations. We help your company reach new customers in a new age of advertising. Each campaign begins with a premium profile created for every location under your management. Each profile is designed to best showcase your business, products, and services. We create a visual consistency for your brand and ensure that all of your franchises are using the same information, logos, and high quality pictures. Our platform allows your team to quickly update your basic information and gives you the flexibility to add new information (new pictures, menus, events, specials or coupons) to each of your profiles. In literally minutes you can add new content that will eventually be shared across thousands of UCampus websites and marketing accounts. How many different advertising companies does your corporate office work with each year? How many similar companies contact your franchises? We offer large companies the opportunity to consolidate their advertising strategy. Quit using traditional print publications, with their rising costs and falling CPMS, and move to a platform with more reliable pricing and service. College students have long since changed they way they consume information. It's time for you to change the way you reach these potential customers. Update your approach today and start taking advantage of the amazing possibilities available to your company. Take a look at how potential customers near all of your locations can connect with your information through the UCampus platform. Contact our corporate sales staff today for a free assessment of what we can do for your company. This website is an unofficial independent source of news and information and it is not affiliated with any school, team, or league. Questions? We're here, send us a message! We're busy or out for a moment, drop us a message and we'll get back to you.